Mirrors figure centrally in Japanese myth and culture. One need look no further than the seminal story of the sun goddess's creation of the archipelago, or at a mirror's supreme importance among the Three Imperial Regalia, for an intimation of the awe with which this object was once viewed. Reminders of this reverence can still be seen today in every Shinto shrine, where a centrally-placed circular mirror stands in for the actual deity, and at the same time not so subtly re-enforces the old belief that a mirror has the power to reflect one's soul. Throughout the Edo Period, the social group most closely associated with mirrors – still at this time rather precious objects made of decoratively cast thick bronze plate and a reflective side coated with … quicksilver! — would have been well-to-do women. Except for a stage performer, no gentleman needed to concern himself about such an implement, any more than he needed to know how to cook; his grooming was taken care of by professionals, or by the females of his household. This fact was obvious to artists of the period, of course, and useful to ukiyo-e designers of actor and courtesan prints, who thrived on offering the public visual cues implying celebrity mystique or feminine ways. Indeed, such artists had another reason, as well, for accenting mirrors. The traditional Japanese one being perfectly round, and portable — remember there were no permanent room-dividers to hang things on — placement of one in a composition provided a much needed circular design element. In fact, one loses count of how often a mirror pops up in kabuki and beauty prints, not to mention the number of times the word mirror (kagami) appears in print titles. As for all the circular inserts at the top of sheets, while some scholars feel the inspiration was the Dutch-introduced telescope, or Chinese windows, a case could be made that those were meant to mimic mirrors, too. Fig. 1 is an ukiyo-e style painting on a disk of paulownia wood 24 cm in diameter. From the small brass handle on its surface, deftly placed to resemble another hair ornament, the soft padded backing on the verso, and most of all the fact that it was found together with a mirror in a lacquer case, one can assume that it was a mirror cover. Finding a circular kabuki painting made to serve this way was intriguing, as it brought me closer to answering a small mystery. Ukiyo-e collectors are familiar with roundel "bust-portrait" actor designs, but in a print the circled head and shoulders appear in the middle of the sheet of paper and are usually surrounded by explanatory text. As it happens, on an ôban sheet (37 x 26 cm), the printed roundels are the same diameter as a mirror, so, though I had never seen evidence of such "handiwork," I often asked myself whether kabuki fans back then were in the habit of cutting up a print to paste the portrait of their idol onto a mirror's back. Very improbable, I surmised, given the uneven metallic surface, never thinking of the possibility of an intermediary disk of wood! What the Munehiro painting shows is that the custom indeed existed of combining ukiyo-e and mirrors, and inviting one's idol into the intimacy of the boudoir. How widespread the behavior was, or if it extended to prints, is unclear. The circa 1855 painting is signed Munehiro, (family name: Hasegawa, active 1848-67), a fairly prolific Osaka actor print designer thought to have been a student of Hirosada (active 1819?-63). Responsible for numerous chûban prints, Munehiro also signed a handful of ôbans, including, it turns out, at least one bust portrait in a roundel. 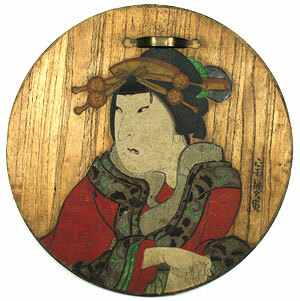 The actor is probably Arashi Rikan III (1812-63), in the unidentified role of a high-ranking courtesan One might wonder why a female fan would "pin up" her idol in onnagata drag – and keep that image in intimate view (and for many seasons, judging from the amount of dust in the wood grain) — but that would lead us into the complex ambiguities of gender shifts in kabuki. This subject is best left for later, except to mention that many Japanese maintain that only a male actor — freed of female cultural baggage — can accurately portray the spiritual essence of a woman. Seen in that light, the lady at her toilette was in effect able to peer at her true soul only before she lifted the cover off the mirror! This article originally appeared (with slightly different content) in Daruma, no. 52, Autumn 2006. Copyrighted © text and pictures reprinted with permission.